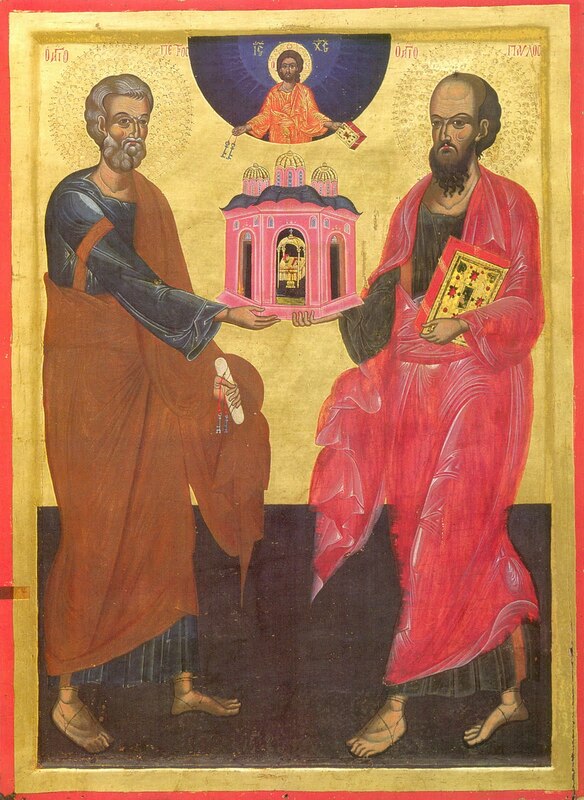 "Today the Holy Church piously remembers the sufferings of the Holy Glorious and All-Praised Apostles Peter and Paul. St. Peter, the fervent follower of Jesus Christ, for the profound confession of His Divinity: "Thou art the Christ, the Son of the Living God," was deemed worthy by the Savior to hear in answer, "Blessed art thou, Simon ... I tell thee, that thou art Peter [Petrus], and on this stone [petra] I build My Church" (Mt.16:16-18). On "this stone" [petra], is on that which thou sayest: "Thou art the Christ, the Son of the Living God" it is on this thy confession I build My Church. Wherefore the "thou art Peter": it is from the "stone" [petra] that Peter [Petrus] is, and not from Peter [Petrus] that the "stone" [petra] is, just as the Christian is from Christ, and not Christ from the Christian. Do you want to know, from what sort of "rock" [petra] the Apostle Peter [Petrus] was named? Hear the Apostle Paul: "Brethren, I do not want ye to be ignorant," says the Apostle of Christ, "how all our fathers were all under the cloud, and all passed through the sea; and all were baptized unto Moses in the cloud and in the sea; and did all drink the same spiritual drink: for they drank of that spiritual Rock that followed them: and that Rock was Christ" (1 Cor.10: 1-4). Here is the from whence the "Rock" is Peter. Our Lord Jesus Christ, in the final days of His earthly life, in the days of His mission to the race of man, chose from among the disciples His twelve Apostles to preach the Word of God. Among them, the Apostle Peter for his fiery ardor was vouchsafed to occupy the first place (Mt.10:2) and to be as it were the representative person for all the Church. Therefore it is said to him, preferentially, after the confession: "I will give unto thee the keys of the Kingdom of Heaven: and whatsoever thou shalt bind on earth, shall be bound in the heaven: and whatsoever thou shalt loose on earth: shall be loosed in heaven" (Mt.16: 19). Therefore it was not one man, but rather the One Universal Church, that received these "keys" and the right "to bind and loosen." And that it was actually the Church that received this right, and not exclusively a single person, turn your attention to another place of the Scriptures, where the same Lord says to all His Apostles, "Receive ye the Holy Spirit" and further after this, "Whose soever sins ye remit, they are remitted unto them: and whose soever sins ye retain, are retained" (John 20: 22-23); or: "whatsoever ye bind upon the earth, shall be bound in Heaven: and whatsoever ye shall loose on earth, shall be loosened in heaven" (Mt.18:18). Thus, it is the Church that binds, the Church that loosens; the Church, built upon the foundational cornerstone, Jesus Christ Himself (Eph 2:20), doth bind and loosen. Let both the binding and the loosening be feared: the loosening, in order not to fall under this again; the binding, in order not to remain forever in this condition. Therefore "Iniquities ensnare a man, and everyone is bound in the chains of his own sins," says Wisdom (Prov 5:22); and except for Holy Church nowhere is it possible to receive the loosening. After His Resurrection the Lord entrusted the Apostle Peter to shepherd His spiritual flock not because, that among the disciples only Peter alone was pre-deserved to shepherd the flock of Christ, but Christ addresses Himself chiefly to Peter because, that Peter was first among the Apostles and as such the representative of the Church; besides which, having turned in this instance to Peter alone, as to the top Apostle, Christ by this confirms the unity of the Church. "Simon of John" -- says the Lord to Peter -- "lovest thou Me?" -- and the Apostle answered: "Yea, Lord, Thou knowest that I love Thee"; and a second time it was thus asked, and a second time he thus answered; being asked a third time, seeing that as it were not believed, he was saddened. But how is it possible for him not to believe That One, Who knew his heart? And wherefore then Peter answered: "Lord, Thou knowest all; Thou knowest that I love Thee." "And sayeth Jesus to him" all three times "Feed My sheep" (John 20:15-17). Besides this, the triple appealing of the Savior to Peter and the triple confession of Peter before the Lord had a particular beneficial purpose for the Apostle. That one, to whom was given "the keys of the kingdom" and the right "to bind and to loose," bound himself thrice by fear and cowardice (Mt.26:69-75), and the Lord thrice loosens him by His appeal and in turn by his confession of strong love. And to shepherd literally the flock of Christ was acquired by all the Apostles and their successors. "Take heed, therefore unto yourselves, and to all the flock," the Apostle Paul urges church presbyters, "over which the Holy Spirit hath made you overseers, to feed the Church of the God, which He hath purchased with His own blood" (Acts 20:28); and the Apostle Peter to the elders: "Feed the flock of God which is among you, taking the oversight thereof not by constraint, but willingly: not for filthy lucre, but of a ready mind: neither as being lords over God's heritage, but being examples to the flock. And when is appeared the Prince of pastors, ye will receive unfading crowns of glory" (1 Pet. 5:2-4). It is remarkable that Christ, having said to Peter: "Feed My sheep," did not say: "Feed thy sheep," but rather to feed, good servant, the sheep of the Lord. "Is Christ divided? was Paul crucified for you? or were ye baptized in the name of Paul?" (1 Cor.1:13). "Feed My sheep". Wherefore "wolfish robbers, wolfish oppressors, deceitful teachers and mercenaries, not being concerned about the flock" (Mt.7:15; Acts 20:29; 2 Pet 2:1; John 10:12), having plundered a strange flock and making of the spoils as though it be of their own particular gain, they think that they feed their flock. Such are not good pastors, as pastors of the Lord. "The good shepherd giveth his life for the sheep" (John 10:11), entrusted to Him by the chief Shepherd Himself (1 Pet 5:4). And the Apostle Peter, true to his calling, gave his soul for the very flock of Christ, having sealed his apostleship by a martyr's death, is now glorified throughout all the world. The Apostle Paul, formerly Saul, was changed from a robbing wolf into a meek lamb. Formerly he was an enemy of the Church, then is manifest as an Apostle. Formerly he stalked it, then preached it. Having received from the high priests the authority at large to throw all Christians in chains for execution, he was already on the way, he breathed out "threatenings and slaughter against the disciples of the Lord" (Acts 9:1), he thirsted for blood, but "He that dwells in the Heavens shall laugh him to scorn" (Ps 2:4). When he, "having persecuted and vexed" in such manner "the Church of God" (1Cor.15:9; Acts 8:5), he came near Damascus, and the Lord from Heaven called to him: "Saul, Saul, why persecutest thou Me?" and I am here, and I am there, I am everywhere: here is My head; there is My body. There becomes nothing of a surprise in this; we ourselves are members of the Body of Christ. "Saul, Saul, why persecutest thou Me; it is hard for thee to kick against the goad" (Acts 9:4-5). Saul, however, "trembling and frightened", cried out: "Who art Thou, Lord?" The Lord answered him, "I am Jesus Whom thou persecutest." And Saul suddenly undergoes a change: "What wantest Thou me to do?" -- he cries out. And suddenly for him there is the Voice: "Arise, and go to the city, and it shall be told thee what thou must do" (Acts 9:6). Here the Lord sends Ananias: "Arise and go into the street" to a man, "by the name of Saul," and baptize him, "for this one is a chosen vessel unto Me, to bear My name before the Gentiles, and kings, and the children of Israel" (Acts 9: 11, 15, 18). This vessel must be filled with My Grace. "Ananias, however, answered: Lord, I have heard from many about this man, how much evil he hath done to Thy saints in Jerusalem: and here he hath authority from the chief priests to bind all who call on Thy Name" (Acts 9:13-14). But the Lord urgently commands Ananias: "Search for and fetch him, for this vessel is chosen by Me: for I shall show him what great things he must suffer for My name's sake" (Acts 9:11, 15-16). And actually the Lord did show the Apostle Paul what things he had to suffer for His Name. He instructed him the deeds; He did not stop at the chains, the fetters, the prisons and shipwrecks; He Himself felt for him in his sufferings, He Himself guided him towards this day. On a single day the memory of the sufferings of both these Apostles is celebrated, though they suffered on separate days, but by the spirit and the closeness of their suffering they constitute one. Peter went first, and Paul followed soon after him. Formerly called Saul, and then Paul, having transformed his pride into humility. His very name (Paulus), meaning "small, little, less," demonstrates this. What is the Apostle Paul after this? Ask him, and he himself gives answer to this: "I am," says he, "the least of the Apostles... but I have labored more abundantly than all of them: yet not I, but the grace of God, which was with me" (1 Cor.15:9-10). And so, brethren, celebrating now the memory of the holy Apostles Peter and Paul, remembering their venerable sufferings, we esteem their true faith and holy life, we esteem the innocence of their sufferings and pure confession. Loving in them the sublime quality and imitating them by great exploits, "in which to be likened to them" (2 Thess 3: 5-9), and we shall attain to that eternal bliss which is prepared for all the saints. The path of our life before was more grievous, thornier, harder, but "we also are compassed about with so great a cloud of witnesses" (Heb 12: 1), having passed by along it, made now for us easier, and lighter, and more readily passable. First there passed along it "the author and finisher of our faith," our Lord Jesus Christ Himself (Heb 12: 2); His daring Apostles followed after Him; then the martyrs, children, women, virgins and a great multitude of witnesses. Who acted in them and helped them on this path? He Who said, "Without Me ye can do nothing" (John 15: 5)." First in prominence among the Apostles, and teachers to the Universe, intercede to the Master of all for peace in the world and for our souls great mercy. O Lord, receive unto the enjoyment of Your good things and Your rest, the steadfast preachers of Godly words, the pinnacle of Your Disciples. Receive their pain and death above every sacrifice, for You alone know the hearts of men. 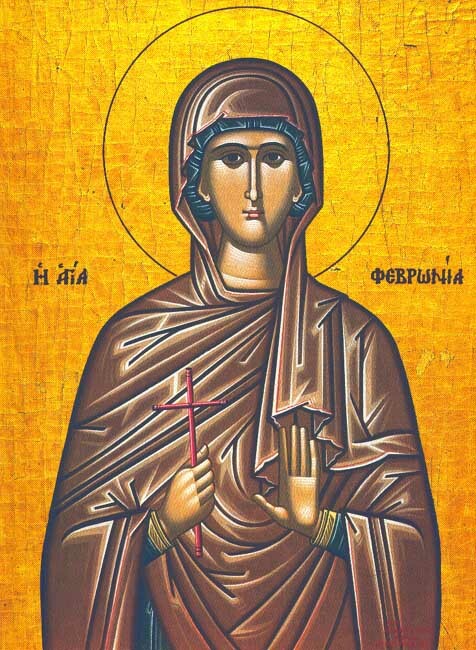 "The Virgin Martyr Febronia suffered during the reign of Diocletian (284-305). She was raised at a monastery in the city of Sivapolis (Assyria). 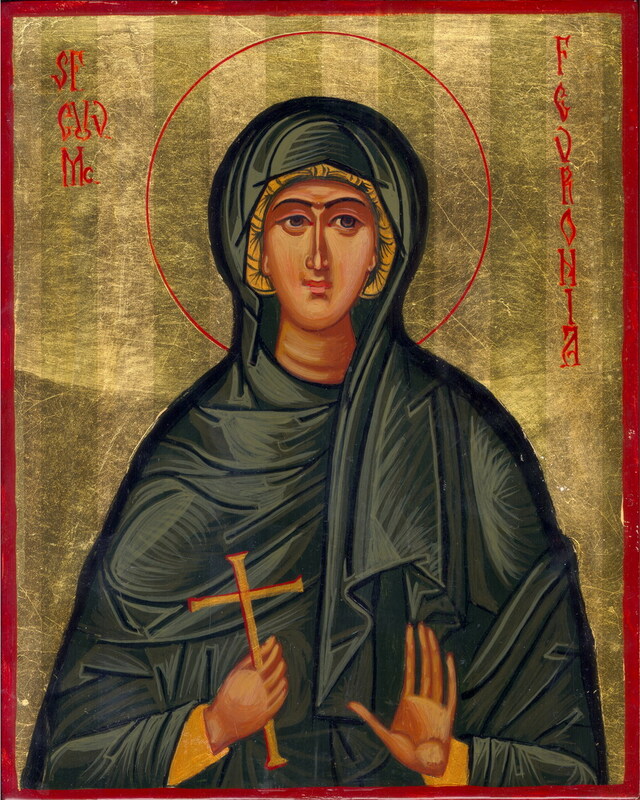 The head of the women's monastery was the abbess Bryaena, the aunt of St Febronia. Being concerned about her niece's salvation, she assigned her a stricter form of life than the other nuns. According to their monastic rule, on Fridays the sisters put aside their other duties and spent the whole day in prayer and the reading of Holy Scripture. The abbess usually assigned the reading to St Febronia. Diocletian sent a detachment of soldiers to Assyria under the command of Lysimachus, Selinus and Primus for the destruction of Christians. Selenos, the uncle of Lysimachus, was noted for his fierce attitude against Christians, but Lysimachus was of a different frame of mind from him, since his mother had sought to inspire love for the Christian faith in her son, and she had died a Christian. Lysimachus had discussed with his kinsman Primus how it would be possible to deliver Christians from the hands of the torturer. When the detachment of soldiers approached the convent, its inhabitants hid. 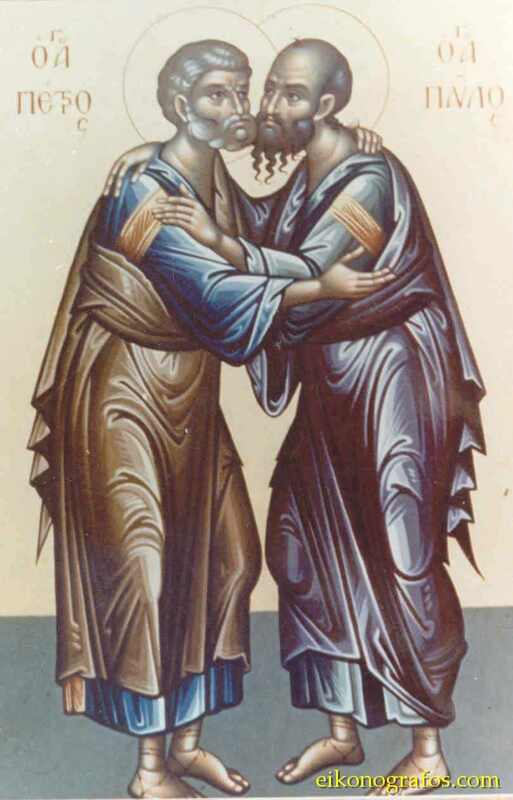 There remained only the abbess Bryaena, her helper Thomais and St Febronia, who was seriously ill at the time. It grieved the abbess terribly that her niece might fall into the hands of the torturers, who might defile her. She prayed fervently that the Lord would preserve her and strengthen her in the confession of Christ the Savior. Selinus gave orders to bring him all the nuns of the convent. Primus with the detachment of soldiers found no one, except the two old women and St Febronia. He regretted that they had not hidden, and he suggested to the nuns that they flee. But the nuns decided not to leave the place of their labors and they entrusted themselves to the will of the Lord. Primus told Lysimachus about the particular beauty of St Febronia and advised him to take her for himself. Lysimachus said that he would not seduce a virgin dedicated to God, and he asked Primus to hide the other nuns somewhere so that they would not fall into the hands of Selinus. One of the soldiers overheard the conversation and told Selinus. [The emperor was informed of the existence of a women's monastery and forthwith soldiers were dispatched to arrest and bring before the judgment seat all the nuns. Breaking down the door with hatchets, one of the soldiers then wielded his sword to strike down the Abbess. A young nun by the name of Fevronia falling at his feet said, "I beg you before God who dwells in the heavens, slay me first, so I may not witness the death of my friend." The soldiers like wild beasts went and seized Fevronia and clapped a heavy iron collar around her neck, and began pushing her about. The soldiers then took Fevronia, ushering her out of the convent. A great multitude assembled in the amphitheater when the saint with an iron collar and hands tied, was brought forward. Everyone in the crowd was moved to compassion. The persecutor then spoke to Fevronia, saying, "Maiden, what are you, slave or freeborn?" Fevronia answered, "Slave. ""Whose slave are you?" "I am the servant of the Lord." He then asked, "What is your name?" She answered, "The poor Christian woman." He then began to try to convince her to marry a man who desired her beauty, but Fevronia answered, "I Have an indissoluble bridal chamber in the heavens that is not made by hands, and a dowry which is the Kingdom of the heaves, and a deathless Bridegroom. Therefore it is not possible to live with a man. Do not be deceived; neither labor to test me with flatteries and Threats, for you will never defeat me." Upon hearing this challenge the tyrant flew into a rage. He ordered that the holy woman be disrobed and displayed before all, so that she might be shamed by her indecent exposure. After the soldiers removed her monastic garb and presented her naked, the perverse tyrant said, "Do you see, Fevronia, what things you could have had and have given up?" Fevronia, a very pure person in body and soul answered, "There is but one Creator Who, in the beginning, made us male and female. Wherefore, I am not only willing to endure this nakedness, but to have each of my limbs dismembered for my Christ if he gives me His Grace to suffer torments for His Love. Therefore I must tolerate this nakedness that I might contest with the devil, your father." Moved to wrath again, the persecutor ordered that four men stretch and bind the nun so that they could mercilessly beat her back. The pitiless men beat her for a long time, whilst others made a fire under her and sprinkled the fire with oil, causing her worse burns. Witnessing this atrocious punishment the crowd cried aloud, "Have compassion on the young woman!" On The contrary he ordered his men to increase the scourging and beating. When it was seen that the strips of her flesh fell to the ground and that she appeared dead, he commanded that she be cast to one side. Seeing her move he said aloud, "How did the first match seem to you, Fevronia?" Christ's martyr answered, "Know that in the first trial with Christ helping me, I not only remained unconquerable, but I regarded your tortures with contempt." The prosecutor then said, "Suspend her upon the wooden pole and lacerate her sides with iron claws; then burn her torn members to the bones." They tore at the saint so that her flesh fell to the ground and her blood streamed forth as a river. Later they brought fire and burned her entrails. Looking steadfastly up into heaven she said, "Come to my aid, O Lords, and do not abandon your servant." Many of the spectators left, unable to bear the persecutors raw pitilessness. She was then taken down and tied to a stake. He continued to try and interrogate her but she wasn't able to answer. Because of this he ordered a physician to cut and remove her tongue and burn it. Hearing this, the saint immediately extended her tongue, nodding to the physician to cut it off. When the physician removed his iron surgical instrument, the crowd asked the persecutor to let her be left alone for a while. The savage man agreed to leave her tongue in place; but ordered instead the breaking of her teeth, which the physician began to do. From the pain and hemorrhaging Fevronia fell unconscious. Upon her coming to, the persecutor asked her, "What do you say Fevronia? Will you worship the gods?" The holy woman answered, "You are an accursed old man! Why do you not slay me quicker that I may go to my beloved Christ, instead of impeding my path?" Then he commanded that her breasts be cut off so her chest might be further burned. When her right breast was cut off and thrown to the group, the saint prayed, "O Lord, my God, behold my affliction and let my soul come into your hands." After the removal of her left breast, she fell silent as all those who witness this spectacle cursed the persecutor and his gods. He then had her removed from the stake, and unable to stand she fell to the earth. He then ordered the severing of both her hands and one foot. Her want was then cut off. When the executioner attempted to remove her foot, the axe missed the joint of the ankle bone. Only after three swings was he able to remove her foot. Fevronia experiencing incredible pain then extended her other foot upon the wooden block so that he might be able to remove the other foot also. Among the crowd was the nun Thomais, who afterwards recorded St Febronia's martyrdom in detail, and also her student Hieria. She came forth out of the crowd and in the hearing of all reproached Selinus for his boundless cruelty. He gave orders to arrest her, but learning that Hieria was of illustrious standing whom he could not readily subject to torture, he said, "By your speech you have brought on Febronia even greater torment." 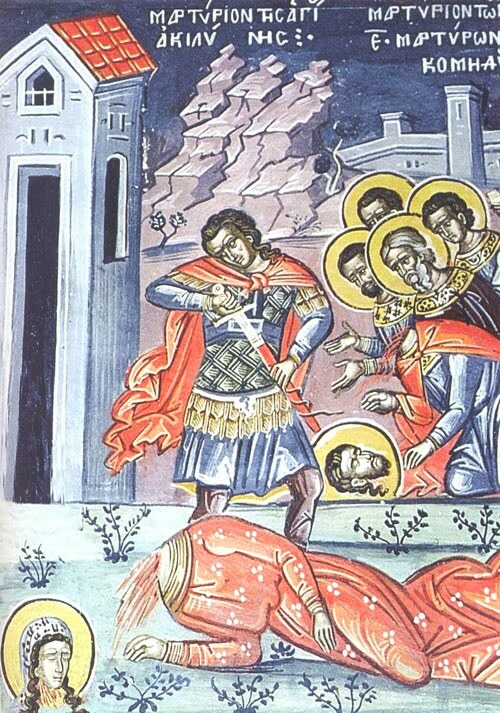 Finally, they beheaded the holy Martyr Febronia. Departing the place of execution, Lysimachus wept and withdrew to his quarters. Selinus made ready to eat, but he was not able to take food, and went off to the quiet of his own chambers. Suddenly, he became like one deranged. Looking up to the heavens, he raved and bellowed like a bull, then fell down and struck his head on a marble column and died. When Lysimachus learned of this, he said, "Great is the God of the Christians, Who has avenged Febronia's blood, so unrighteously shed!" He prepared a coffin, placed the martyr's body in it, and took it to the convent. Abbess Bryaena fell senseless, seeing the mutilated remains of St Febronia. Later, she recovered her senses and gave orders to open the convent gates so that all would be able to come and venerate the holy martyr and glorify God Who had given her such endurance in suffering for Christ. Lysimachus and Primus renounced their idol worship and accepted both Baptism and monasticism. Hieria gave her wealth to the convent and petitioned Abbess Bryaena to accept her at the convent in place of St Febronia. Every year, on the day of the martyric death of St Febronia, a solemn feast was celebrated at the convent . During the time of the all-night Vigil the nuns always saw St Febronia, at her usual place in church. From the relics of St Febronia occurred numerous miracles and healings. 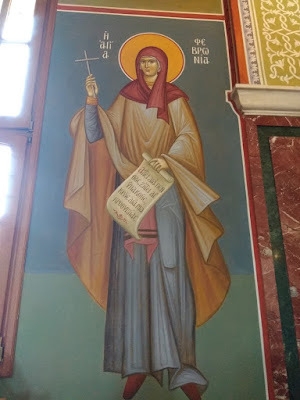 The Life of St Febronia was recorded by the nun Thomais, an eyewitness to her deeds. 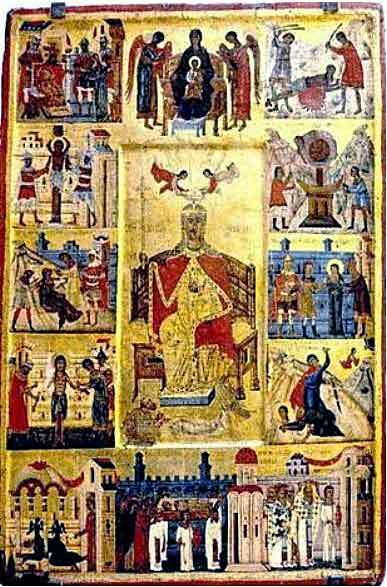 In the year 363 the relics of St Febronia were transferred to Constantinople. Soon after the death of St Febronia, St James the Bishop of Nisibis (January 13) built a church and transferred into it a portion of the of the holy martyr's relics." Before judgment standing, bloody and pale. As a palm branch, the young Febronia. O yes, the beautiful countenance of my Bridegroom! Cut off, cut off my feet - paths they have traveled! Cut off, cut off my hands - work they have completed! Cut out, cut out my tongue - with my heart I will pray! Smash, smash my mouth - with my heart, I will speak! Whip, crush the body - why do I need the body? Among the angels, in sweet Paradise. That the fury of your life will die. Each, his deeds, will bring with him. Like a fragrant rose in the ascetic life, you breathed forth the myrrh of Christ. Therefore he has glorified you as a righteous martyr, O Febronia. Now intercede with him for those who cry: "Rejoice, O noble and blessed martyr!" 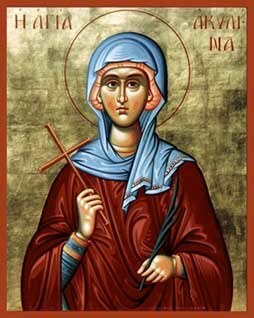 You were adorned with the grace of virginity and the beauty of martyrdom, O Febronia, bride of Christ. You wisely carried your lamp and ran to your Bridegroom receiving an incorruptible crown. Pray for those who faithfully sing hymns of praise to you! I perceive you, O pure virgin, as a chosen rose, for you were given to the King of the heavens from childhood, and you followed Him, struggling ascetically in the angelic pursuit. Therefore shining with the beauty of virginity, and serving as a good steward of Godly-worked virtues, you struggled in martyrical feats. With manly mind and an unastonished heart, you astonished all by your struggle, O Righteous Martyr. For you steadfastly endured unbearable beatings, breaking of teeth, burnings and cuttings of your holy members, for the love of Christ your Bridegroom. 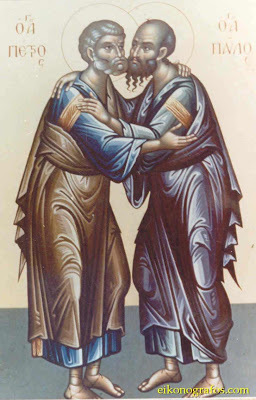 Therefore because of this, you were wondrously glorified, and you ever intercede, Fevronia, for those who faithfully sing hymns of praise to you! The whole life of the Forerunner was a harsh life. On the years of his childhood, we know only that which is told us by the Evangelist Like, in other words, “he grew and became strong in spirit, and was in the desert until the day of his public ministry towards Israel” (Luke 1:80). How and when the child was found in the desert we do not know for sure. According to tradition, King Herod, after the slaughter of the children in Bethlehem, wanted to kill John, but he couldn’t find him. This angered him greatly, and because of this he ordered his father Zacharias be killed. His mother, having learned that the soldiers were looking for the child, took him and went with him to a desolate mountain region. There having lived a short time, his mother died and the small John remained by himself in the desert. We do not know how the Lord God fed him, how he protected him from the wild animals, neither do we know how the young Forerunner learned to eat akrides and wild honey. But we firmly believe, however, that for God all things are possible. See, therefore, that from the beginning, the life of him who would be called “[greatest] among those born of women” (Matthew 11:11) was an unprecedented and unheard of life. He remained in the desert totally by himself until thirty years of age. What did he do in the desert? What did he occupy himself with? He did not have any handiwork, and didn’t have books, neither did he know letters. The biographies of the great philosophers, such as Descartes and Kant, relate that these men spent whole days and nights sitting in their armchairs, engrossed in their thoughts. Philosophy is deep, but deeper still is theologic meditation, the greatest form of prayer, which the holy fathers call noetic prayer. The depth of communion in Spirit which the saints have with God is inconceivably great…In the ceaseless contemplation of God and of the fortunes of the world, in deep communion of prayer with God, his spirit grew and his understanding of the ways of salvation increased, to which he would teach the people, who were being lost in their sins. He would have to change their thoughts and the senses of the people, to make them deeper. To urge them to repent and to change their perverted and evil ways. This was roughly the purpose, to prepare the road, in other words, for our Lord and Savior Jesus Christ, which He intended for His great Forerunner." O Prophet and Forerunner of the presence of Christ, we who fervently honor you cannot worthily praise you. For by your revered and glorious birth the barrenness of your mother and the muteness of your father were unbound, and the incarnation of the Son of God is proclaimed to the world. 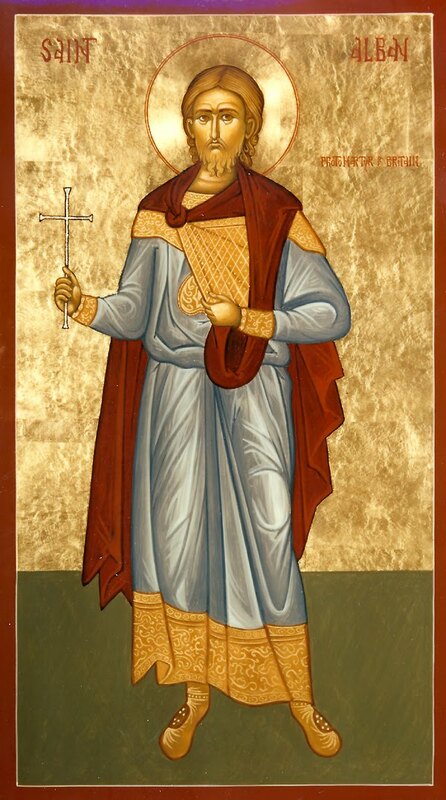 "The Church in The British Isles will only begin to grow when she begins to venerate her own Saints"
"Saint Alban (or Albanus), the protomartyr of Britain, was a Roman citizen who lived at Verulamium (modern St Albans), a few miles northwest of London, during a time of persecution. Nothing is known about his family or his occupation. The chief magistrate of the city had orders to arrest all Christian clergy. One of them, a priest named Amphibalus, fled to Alban's home in order to hide from the soldiers who wished to kill him. 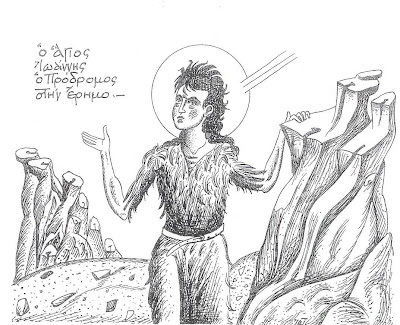 Alban was impressed by the priest's constant prayer and vigil, and so he questioned Amphibalus about his beliefs. As a result, Alban came to believe in Christ and asked to be baptized. Eventually, Amphibalus was forced to move on, and Alban changed clothes with him so that he could get away. The soldiers heard there was a priest hiding in Alban's house, so they came to search it. Seeing Alban dressed in the priest's clothes, they arrested him and brought him before the judge. The magistrate was offering sacrifice to idols when St Alban appeared before him. After questioning him, he discovered how Alban and the priest had switched clothes. Furious because Alban had allowed a fugitive to escape, the magistrate threatened him with death unless he returned to paganism and revealed where Amphibalus had gone. St Alban replied, "I am also a Christian, and I worship the true God." After having the saint beaten and tortured, the magistrate threatened him with execution. St Alban rejoiced and glorified God. 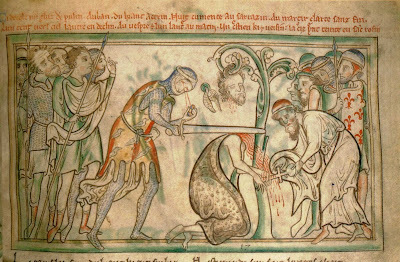 The magistrate ordered the soldiers to take St Alban to the Holmhurst Hill to be beheaded. When they came to the river Ver, they saw that the bridge was crowded with people who had come to witness Alban's martyrdom. Since they could not proceed because of the multitude of people, St Alban p rayed and made the Sign of the Cross over the river. At once, the waters parted so that they were able to cross over to the other side. The executioner was so astonished by the miracle that he threw down his sword and refused to behead the saint. He was arrested, and another man was found to behead them both. There is a tradition that St Alban became thirsty while climbing the hill and asked for water. A small spring gushed forth near the top of the hill, and he was able to drink from it. Pilgrims used to come and drink from St Alban's well, but it is now dry. The date of St Alban's martyrdom is uncertain, but it is believed that it took place during the reign of Decius (ca. 251) or Valerian (ca. 257). The eighteenth century Turin manuscript (which may be based on a fifth century source) suggests that St Alban may have been executed as early as 209, when the emperor Septimus Severus and his two sons were in Britain. The name of the executioner who was converted has not been preserved. The priest Amphibalus was ultimately caught and put to death at a place called Redbourn, four miles from Verulamium. When people began to cry out against the magistrate, he put an end to the persecution. 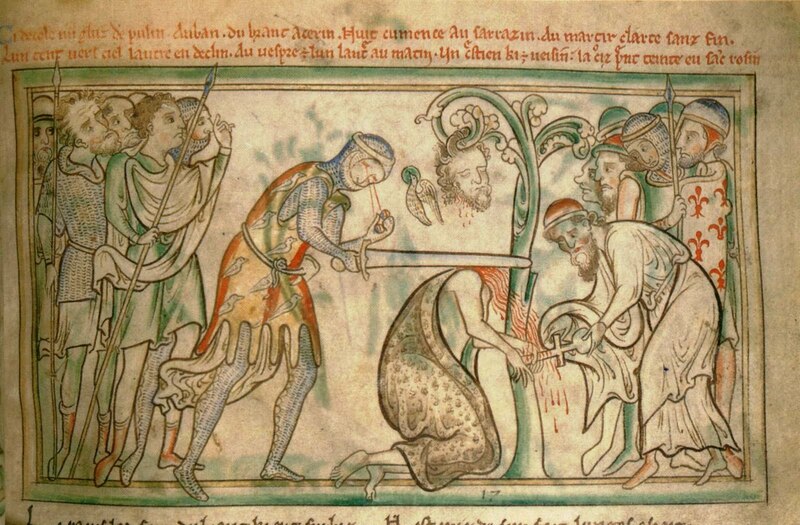 In later years a cathedral was built on the site of the martyrdom, and the relics of St Alban, the priest Amphibalus, and perhaps even the executioner were enshrined within. St Bede (May 27) tells us that miracles frequently took place at St Alban's tomb. When the Danes invaded England in 860, the relics were removed for safekeeping, then later returned. A new chapel and shrine were built for the relics in the early fourteenth century. Two hundred years later, during the dissolution of the monasteries under Henry VIII, the marble shrine was destroyed. Much later, the fragments of the s hrine were reassembled on its former site. What happened to the relics is uncertain, but it is probable that they were either destroyed or buried in an unmarked spot. Although St Alban is sometimes depicted in military garb, there is no evidence that he was a soldier. After all, he was living in a private home when he was arrested, and not in a barracks. There is a medieval painting in the south aisle beside the Choir in the Abbey which depicts St Alban with red hair. A medieval seal, now in the Durham Cathedral Chapter Library, shows him with a thick beard. He is stocky, with a high, round and balding forehead, and a cloak covers his left side and right shoulder." "In June 2002 a scapula (shoulder blade), believed to be a relic of St Alban, was presented to St Albans Cathedral and placed inside the saint’s restored 13th century shrine. The bone was given by the Church of St. Pantaleon in Cologne, Germany. St Pantaleon's, like St Albans Cathedral a former Benedictine abbey church that had a shrine dedicated to St Alban, has possessed remains believed to be those of St Alban since the 10th century. It is entirely possible that further relics were acquired by the church in the 16th century at the time of the Dissolution of the Monasteries in England, when many such relics were smuggled abroad to prevent their destruction. St Albans Abbey was dissolved in 1539. 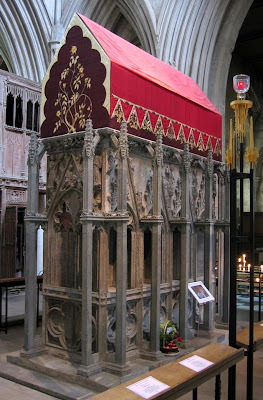 The largest relic of St Alban in England is the thigh of the protomartyr preserved at St Michael's Benedictine Abbey, Farnborough, Hampshire, which was removed from the St Pantaleon's reliquary in the 1950s." On "Lord, I have cried ...", 6 stichera: in Tone I: Spec. Mel. : "O most lauded martyrs ..."
Arise, ye Christian peoples of Albion, leap for joy and join chorus, lifting your voices in sacred hymnody, and let us praise Alban the most laudable, who in accordance with his name was washed whiter than snow by the blood of his martyrdom; for, confessing Christ before the ungodly tyrant, he received a heavenly crown from his Master on high. O Verulamium, once armed with pagan might, beyond thy ruins rose a new and Christian city, in the place where the holy Alban suffered, and where the shrine of his precious relics was established, to which the faithful have recourse, even in our times; for the grace divine which emboldened him to lay down his life for his Lord doth constantly shine forth upon us who venerate his glorious martyrdom. O heathen worshipers of false deities, who in your madness venerate the elemental forces of nature as divine, ye are confounded and put to shame by the courageous witness of Alban most wise, who, brought before the pitiless tyrant, steadfastly refused to offer sacrifice to inanimate things, bravely proclaiming with the Psalmist that the gods of the pagans are demons. Wherefore, having witnessed to Christ on earth, he hath inherited His kingdom in the heavens. With faith, piety and devotion let us hasten to the sacred shrine of the wondrous martyr Alban, the first in Britain to shed his blood for Christ the Lord, for Whom he willingly laid down his life; and let us pray that through his supplications our souls may find mercy and salvation. Kontakion, in Tone II: Spec. Mel. : "Seeking the highest ..."
Imbued with courage and bravery from on high, the glorious martyr Alban stood undaunted before the tyrant and boldly confessed Christ as the only God of all; and he utterly refused to offer sacrifice to false deities. Wherefore, having laid down his life for the Lord, he maketh earnest entreaty in behalf of our souls. Heeding well the words of the Saviour to His disciples, thou didst not fear him who could slay thy body, for he was unable to kill thy soul. For this cause, what was taught thee in the darkness by the Christian priest, whose life thou didst save, thou didst proclaim in the light; and what thine ear took in of his pure teaching, thou didst declare openly before the tribunal. Wherefore, having laid down thy life for the Lord, thou makest earnest entreaty in behalf of our souls. For the full service of St. Alban in English, see: http://orthodoxengland.org.uk/servalb.htm. The pillar represents the column to which Pilate bound Christ “when he…scourged Him” (St. Mark 15:15) “by Whose stripes we were healed” (Isaiah 53:5; I St. Peter 2:24). The wreath garlanding the Cross represents the “crown of thorns” (St. Matthew 27:29: St. Mark 15:17; St. John 19:2. 5) that “the soldiers platted” (St. John 19:2) and “put upon…[the]…head” (St. Matthew 27:29) of “God our King of old” (Psalm 73:13), Who freed man from having to contend against “thorns…and thistles…in the sweat of …[his]…face” (Genesis 3:18-19). The upright post and the traverse beam represent the stipes and the patibulum that formed “the Cross of our Lord Jesus Christ” (Gala-tians 6:14), upon which “all day long…[He] stretched forth…[His]… hands unto a disobedient and gainsaying people” (Isaiah 65:2; Romans 10:21). The four spikes at the center of the Cross and the hammer beneath its base represent the “nails” (St. John 20:25) and hammer with which “they pierced” (Psalm 21:16; St. John 19:37) “His hands and His feet” (St. Luke 24:40). when they “lifted up from the earth” (St. John 12:32) Him Who “blott[ed] out the handwriting of ordinances that was against us…[by]…nailing it to His Cross” (Colossians 2:14). The base upon which the Cross stands represents “the place, which is called “Calvary” (St. Luke 23:33), or “Golgotha, that is to say, the Place of the Skull” (St. Matthew 27:33), “where they crucified Him” (St. John 19:18) Who “wrought salvation in the midst of the earth” (Psalm 73:13). The skull and crossbones represent “the first man Adam” (I Corinthians 15:45), who by tradition “return[ed] unto the ground” (Genesis 3:19) at this very spot, the reason that this place of execution, “full of dead men’s bones” (St. Matthew 23:27). became the place where “the last Adam was made a quickening spirit” (I Corinthians 15:45). The plaque on top of the Cross represents the titulus, the “title” (St. John 19:19-20), with “the superscription of His accusation” (St. Mark 15:26), which “Pilate wrote” (St. John 19:19) “and set up over His head” (St. Matthew 27:37); however, instead of “Jesus of Nazareth the king of the jews” (St. John 19:19), which “was written over Him in letters of Greek, and Latin, and Hebrew” (St. Luke 23:38). the three languages being an allusion to the Three Hypostases “of the Father, and of the Son, and of the Holy Spirit” (St. Matthew 28:19), this titulus reads, “The King of Glory” (Psalm 23:7-10), “for had they known it. they would not have crucified the Lord of glory” (I Corinthians 2:8). The reed represents the “hyssop” (St. John 19:29) upon which was put “a sponge full of vinegar” (St. Mark 15:36), which was then “put to His mouth” (St. John 19:29) when in His “thirst they gave… [Him]…vinegar to drink” (Psalm 68:21), Him of Whom it was said that “all…wondered at the gracious words which proceeded out of His mouth” (St. Luke 4:22). The lance represents the “spear [that] pierced His side”; “and forthwith came there out blood and water” (St. John 19:34) from Him Who “took one of…[Adam's]…ribs, and closed up the flesh instead thereof (Genesis 2:21) and Who “washed us from our sins in His Own blood” (Apocalypse 1:5). The plaque at the bottom of the Cross represents the suppedaneum of Christ, “His footstool” (Psalm 98:5), “the place where His feet have stood” (Psalm 131:7). It is slanted because, according to one tradition, at the moment when “Jesus cried with a loud voice, and gave up the spirit” (St. Mark 15:37), He allowed a violent death spasm to convulse His legs, dislodging His footrest in such a manner that one end pointed upwards, indicating that the soul of the penitent thief, Saint Dismas, “the one on His right hand” (St. Mark 15:27). would be “carried up into Heaven” (St. Luke 24:51), while the other end, pointed downwards, indicated that the soul of the impenitent thief, Gestas, “the other on His left” (St. Mark 15:27), would “be thrust down to Hell” (St. Luke 10:15), showing that all of us, “the evil and…the good. …the just and…the unjust” (St. Matthew 5:45), “are weighed in the balance” (Ecclesiasticus 21:25) of the Cross of Christ. The ladder and the pincers beneath the base of the Cross represent the means of deposition by which Saint Joseph of Arimatruea, “a rich man” (St. Matthew 27:57) who “begged the body of Jesus” (St. Matthew 27:58; St. Luke 23:52), “took it down” (St. Luke 23:53), so that as in body He descended from the Cross, so in soul “He also descended first into the lower parts of the earth” (Ephesians 4:9), “by which also He went and preached unto the spirits in prison” (I St.Peter 3:19). Through these instruments, “the Cross of Christ” (I Corinthians 1:17: Galatians 6:12: Philippians 3:18) became the “Tree of Life” (Genesis 2:9; 3:22, 24; Proverbs 3:18, 11:30, 13:12. 15:4; Apocalypse 2:7; 22:2, 14), by which the Lord Jesus reified His words that, “I am the resurrection, and the life: he that believeth in Me. though he were dead, yet shall he live: and whosoever liveth and believeth in Me shall never die” (St. John 11:25-26). •Cξζ∈ - Σταυρού Ξύλω ζωήν εύρομεν, - "Through the Tree of the Cross have we found life"
•ΑΔΑΜ - Αδάμ, - "Adam"
There are other items and abbreviations that may appear on the Analabos, but these are sufficient to demonstrate that this holy garment silently proclaims “the preaching of the Cross” (I Corinthians 1:18) through its mystical symbolism, declaring for its wearer, “God forbid that I should glory, save in the Cross of our Lord Jesus Christ, by Whom the world is crucified unto me, and I unto the world” (Galatians 6:14). "In the Life of the great Father of the Egyptian desert, St. Paisius the Great (June 19), we may see a shocking example of how easy it is to lose the grace of God. Once a disciple of his was walking to a city in Egypt to sell his handiwork. On the way he met a Jew who, seeing his simplicity, began to deceive him, saying: "O beloved, why do you believe in a simple, crucified Man, when He was not at all the awaited Messiah? Another is to come, but not He." The disciple, being weak in mind and simple in heart, began to listen to these words and allowed himself to say: "Perhaps what you say is correct." When he returned to the desert, St. Paisius turned away from him and would not speak a single word to him. Finally, after the disciple¹s long entreaty, the Saint said to him: "Who are you? I do not know you. This disciple of mine was a Christian and had upon him the grace of Baptism, but you are not such a one; if you are actually my disciple, then the grace of Baptism has left you and the image of a Christian has been removed." The disciple with tears related his conversation with the Jew, to which the Saint replied: "O wretched one! What could be worse and more foul than such words, by which you renounced Christ and His divine Baptism? Now go and weep over yourself as you wish, for you have no place with me; your name is written with those who have renounced Christ, and together with them you will receive judgment and torments." On hearing this judgment the disciple was filled with repentance, and at his entreaty the Saint shut himself up and prayed to the Lord to forgive his disciple this sin. The Lord heard the Saint¹s prayer and granted him to behold a sign of His forgiveness of the disciple. The Saint then warned the disciple: "O child, give glory and thanksgiving to Christ God together with me, for the unclean, blasphemous spirit has departed from you, and in his place the Holy Spirit has descended upon you, restoring to you the grace of Baptism. And so, guard yourself now, lest out of sloth and carelessness the nets of the enemy should fall upon you again and, having sinned, you should inherit the fire of gehenna." 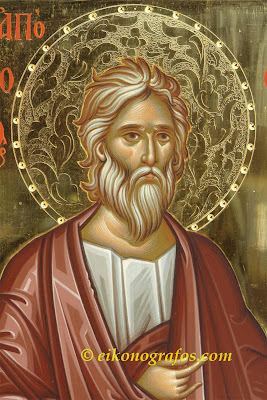 "The Holy Apostle Jude, one of the twelve apostles of Christ, is descended from King David and Solomon, and was the son of Righteous Joseph the Betrothed (Sunday after the Nativity of the Lord) by his first wife. The Holy Apostle John the Theologian writes in his Gospel, "... neither did his brethren believe in Him" (John. 7:5). St Theophylact, Archbishop of Bulgaria, explains this passage. He says that at the beginning of the Lord Jesus Christ's earthly ministry, Joseph's sons, Jude among them, did not believe in His divine nature. Tradition says that when St Joseph returned from Egypt, he began to divide his possessions among his sons. He wanted to allot a share to Christ the Savior, born miraculously and incorruptibly from the All-Pure Virgin Mary. The brothers were opposed to this because Jesus was born of another mother. Only James, later called "The Brother of God," offered to share his portion with Him. Jude came to believe in Christ the Savior as the awaited Messiah, and he followed Him and was chosen as one of the twelve Apostles. Mindful of his sin, the Apostle Jude considered himself unworthy to be called the Lord's brother, and in his Epistle he calls himself merely the brother of James. 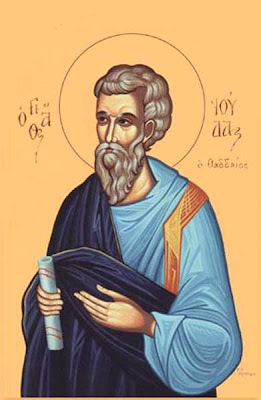 The Holy Apostle Jude also had other names: the Evangelist Matthew terms him "Lebbaeus, whose surname was Thaddeus" (Mt. 10:3). The Holy Evangelist Mark also calls him Thaddeus (Mark 3:18), and in the Acts of the Holy Apostles he is called Barsabas (Acts 15: 22). This was customary at that time. After the Ascension of the Lord Jesus Christ, St Jude traveled about preaching the Gospel. He propagated the faith in Christ at first in Judea, Galilee, Samaria and Idumaia, and later in the lands of Arabia, Syria and Mesopotamia. Finally, he went to the city of Edessa. Here he finished the work that was not completed by his predecessor, St Thaddeus, Apostle of the Seventy (August 21). There is a tradition that St Jude went to Persia, where he wrote his catholic Epistle in Greek. In the Epistle much profound truth was expressed in a few words. 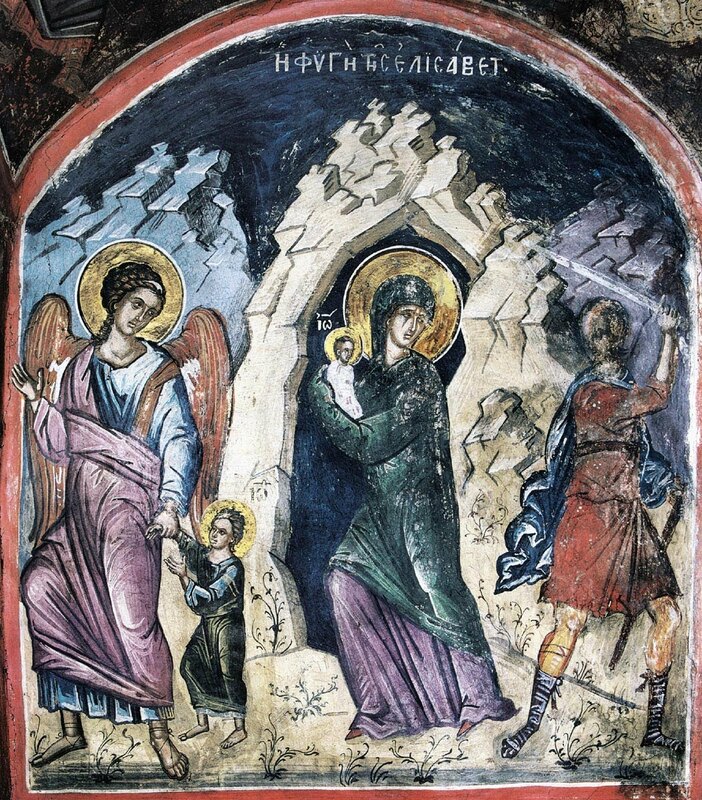 St Jude's Epistle speaks about the Holy Trinity, about the Incarnation of the Lord Jesus Christ, about the good and bad angels, and about the dread Last Judgment. 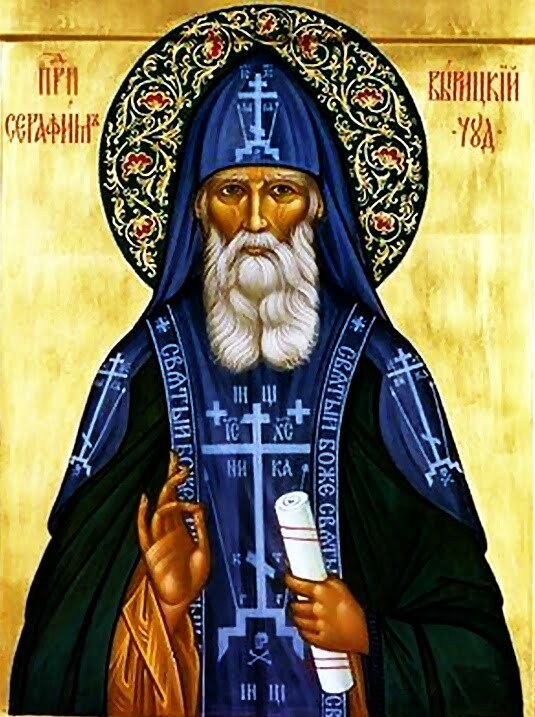 The Apostle urges believers to guard themselves against fleshly impurity, to be diligent in prayer, faith and love, to convert the lost to the path of salvation, and to guard themselves from the teachings of heretics. He also says that it is not enough just to be converted to Christianity, but faith must be demonstrated by good works. He cites the rebellious angels and men punished by God (verses 6 ff.) to support this. 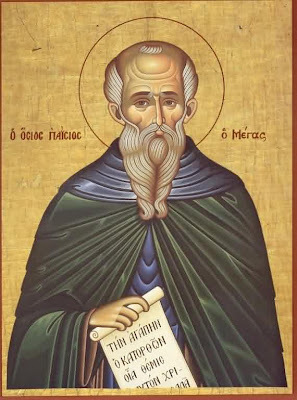 The Holy Apostle Jude died as a martyr around the year 80 near Mt. Ararat in Armenia, where he was crucified and pierced by arrows." Divinely we praise you, O Jude, as a faithful witness, knowing you to be the brother of Christ. You trampled on delusion, and so preserved the faith. Today as we celebrate your holy memory, by your intercessions we receive remission of sins. You were chosen as a disciple for your firmness of mind: an unshakable pillar of the Church of Christ, you proclaimed His word to the Gentiles, telling them to believe in one Godhead. You were glorified by Him, receiving the grace of healing, healing the ills of all who came to you, O most praised Apostle Jude! For the full Service and Paraklesis of the Saint in Greek, see: http://voutsinasilias.blogspot.com/2009/06/19_17.html. καὶ ἐξ οὐρανοῦ τὰ νῦν ἀοράτως ἐνισχύεις. ὅπως γενώμεθα μιμηταί σου οἱ ἐκ πόθου τιμῶντες τὴν μνήμην σου. and whom you now strengthen invisibly from heaven. that we may become imitators of you, who out of fervor honor your memory. For quotes from St. Justin Popovich on the Papacy and the Apostolicity of the Church, see: http://full-of-grace-and-truth.blogspot.com/2010/04/quotes-from-st-justin-popovich-on.html. 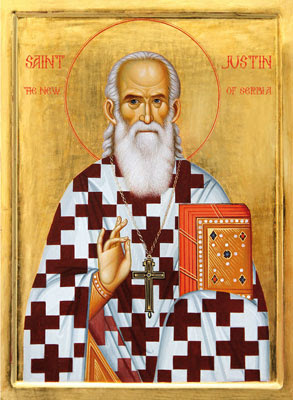 For the life of St. Justin, see: http://www.orthodoxphotos.com/Holy_Fathers/St._Justin_Popovich/. "Some behold this and ask, for what reason was God pleased to bring about new Martyrs in these times? We note the following five things: A. that there be a renewal of the whole Orthodox faith. B. that those of other faiths be without defense on the Day of Judgment. C. that they might be the glory and the boast of the Church of the East, and the reproach and despised by the heterodox. D. that they might be an example of patience to all Orthodox Christians that are tyrannized under the heavy yoke of slavery. E. and finally, that they bravely compel through the martyrical work until death all Christians who at some point are called to martyrdom, especially those who had formerly denied the Orthodox faith." These New Martyrs came from all walks of life, all ages, and all professions. Some were clergy and monastics, others were lay men and women. Some were faithful Christians, others had denied Christ but returned to Him, and still others had converted to Orthodoxy from islam and proceeded to suffer for Christ. 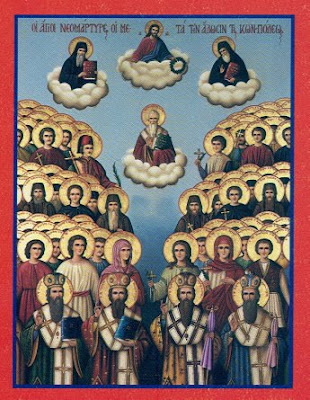 Many of the most-beloved Orthodox Saints help comprise this glorious band of Neomartyrs (e.g. 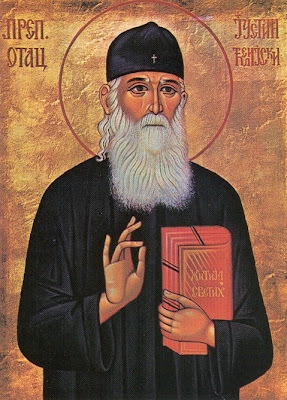 St. Kosmas Aitolos, Sts. 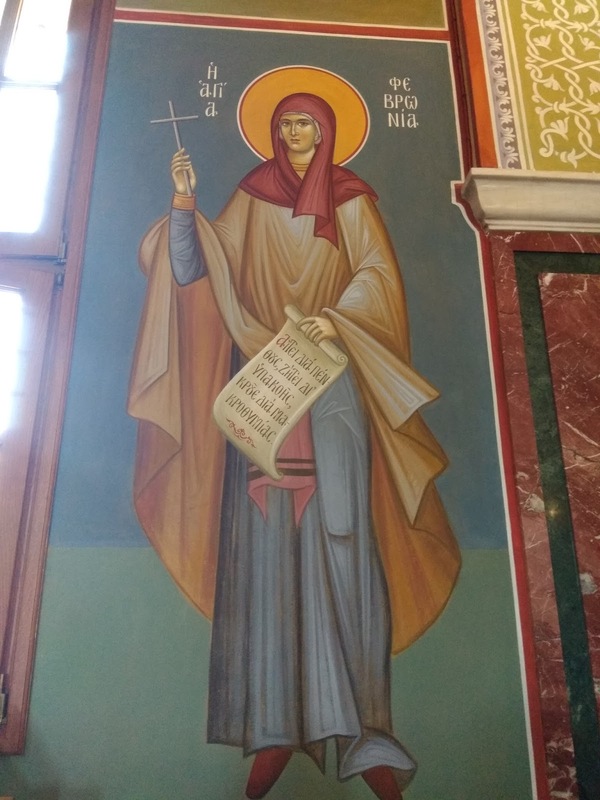 Raphael, Nicholas and Irene, St. Ephraim of Nea Makri, St. George of Ioannina, St. Constantine of Hydra, St. Polydoros, St. Theodore the Byzantine, Sts. 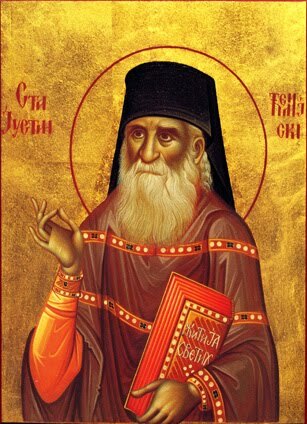 Euthemios, Akakios and Ignatios, St. Gregory V, Patriarch of Constantinople, St. Philothei of Athens, St. Seraphim Archbishop of Phanarion, St. Chryse the New of Meglin, St. Argyre, and many, many more). For an excellent book of the lives of many Neomartyrs under the Turkish yoke, see: Witnesses for Christ by Vaporis. 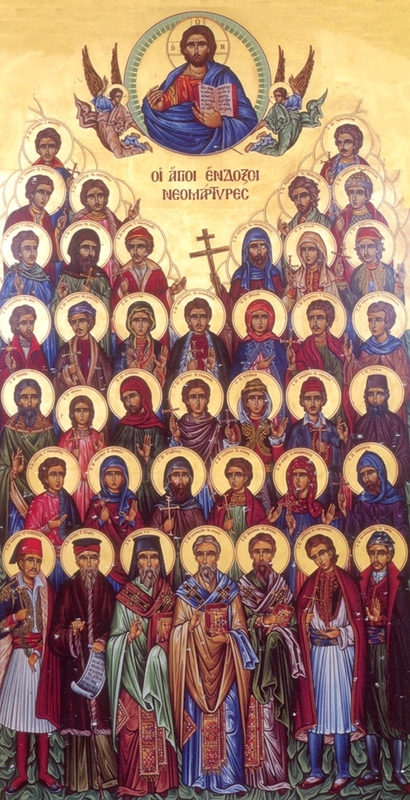 For more on these Neomartyrs online, see: http://www.johnsanidopoulos.com/2010/06/new-martyrs-of-turkish-yoke.html and http://www.johnsanidopoulos.com/2010/06/greek-new-martyrs-under-ottoman-rule.html; http://full-of-grace-and-truth.blogspot.com/search/label/New%20Martyrs. May we all imitate their struggle till death for Christ, and may they intercede for us all! The New Martyrs trampled upon the ancient error, and lifted up the faith of the Orthodox, and struggled valiantly. The faith of the lawless they despised, and they proclaimed Christ with boldness as perfect God. And they ever intercede unceasingly that great mercy be granted to us. Rejoice mystically, O Church of Christ, seeing your sons, the Neomartyrs, surrounding your table and altar as olive trees, arrayed as newly-illumined stars, and to the Creator cry out: You are the strength of the Martyrs, O Christ. We ever, O bretheren, have need to remember and wonder at the inscrutable judgments of the providence of our man-loving God, Who even during the long period of tyrannical slavery of our people, worked a multitude of good things for our tyrannized souls. And especially, through this and from this, the glorious boasts, the friends of Christ, and the heavenly treasuries grew forth bearing fruit, Newly-revealed Martyrs. They are now worthy to be praised, for these who were brave in soul, and arrayed with the power of Christ as a breastplate, counted all things of life as refuse, and did not at all spare their flesh, and struggled bravely in the stadium, and were triumphant against the impiety of the Hagarenes, and proclaimed the faith of Christ with boldness, and because of this, suffered many forms of tortures bravely, and struggled until the end, and were granted the crown of martyrdom. To the Bestower-of-crowns let us cry out: You are the strength of the Martyrs, O Christ. "Aquilina was born in the Palestinian town of Byblus of honorable Christian parents. At age seven, little Aquilina was already completely versed in the true Christian life and at age ten she was so filled with divine understanding and the grace of the Holy Spirit that she, with great power and zealousness, preached Christ to her female companions. When Diocletian's persecution began, someone accused Aquilina before Volusian, the imperial deputy, who was more like a beast than a man. At first, Volusian ordered that Aquilina be flogged and after that, a red hot rod be pierced through her ears and brain. Until the last moment, the virgin Aquilina freely and openly confessed Christ the Lord and when her brain and blood began to flow from her head, she fell as though dead. The deputy, thinking Aquilina was indeed dead, ordered her body to be carried outside the city and thrown upon a dung heap for the dogs to consume. But, an angel of God appeared to her at night and said to her: "Arise, and be whole!" And the virgin arose and was whole and for a long time she offered up praise of thanksgiving to God imploring Him not to deprive her to fulfill her martyr's mortification. A voice from heaven was heard: "Go, it will be to you as you pray" and Aquilina set out for the town. The gates of the town opened on their own accord before her and she entered like a spirit into the palace of the deputy and appeared before his bed. The deputy was seized with unspeakable fear, seeing the virgin alive whom he thought was dead. The following day, according to his command, the executioners led Aquilina out to behead her. Before her beheading, the virgin Aquilina prayed to God on her knees and gave up her soul. The executioner beheaded her lifeless head. Her relics gave healing to many of the sick. Aquilina was twelve years old when she suffered for the Lord: suffered and crowned with the martyr's wreath in the year 293 A.D."
O Lord Jesus, to You Your lamb cries with a great voice, “O my Bridegroom, You I love; and seeking You, I now contest, and with Your baptism am crucified and buried. I suffer for Your sake, that I may reign with You; for Your sake I die, that I may live in You: accept me offered out of longing to You as a spotless sacrifice. Lord, save our souls through her intercessions, since You are great in mercy. With the sprinkling of your blood you were made pure, O fair virgin, and with crowns of martyrdom you are crowned, O Akylina; Christ your Bridegroom, Who gives life everlasting and for this reason has given you to those in afflictions, for the healing of their illness and their salvation when they in faith flee to you.